Ahmed Ghouri, M.D., Founder & CEO, Raghu Sugavanam, Founder & President, Interpreta The concepts of precision medicine and timely care delivery are starting to move from experimental stages to the clinical front lines, helping caregivers tailor care decisions to individual patients. But for this new healthcare paradigm to realize its promise of saving and improving more lives, the healthcare industry must identify and correct the gaps between genomic science and clinical applications. Headquartered in San Diego, CA, Interpreta is meeting this critical challenge with the power of clinical and genomic interpretation. Founded by three seasoned technology entrepreneurs, Dr. Ahmed Ghouri, Gary Rayner, and Raghu Sugavanam, Interpreta targeted the genomics revolution that began a few years ago with affordable and accurate DNA sequencing. Realizing that interpretations in the macroscopic clinical and atom-level genomic domains were disjointed, they felt these interpretations were worthy of unification into a single, real-time system. “Imagine a GPS system that only works for major highways, but not for minor roads. It won’t get you anywhere,” says Dr. Ghouri. Interpreta tapped in to this massive opportunity and developed a real-time clinical and genomic interpreter. The result was a powerful analytics engine that continuously updates, interprets, and synchronizes clinical and genomics data, creating a personalized roadmap and enabling the orchestration of timely care. The real-time insights from Interpreta provide physicians, care managers, and payers with the patient-specific information needed for quality improvement, patient prioritization, population management, and precision medicine. “By creating a patient road map led by clinical and genomics data, Interpreta can match an individual with the best possible treatment in real time,” says Dr. Ghouri. Achieving this feat was not a cakewalk for Interpreta. 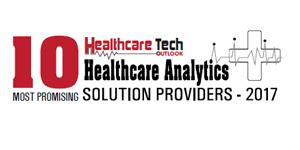 Most players in the market today use costly technologies like solid state drives, parallel processing, map reduction, and distributed computing to perform the analytics on the medical data. “However, you can’t create an advantage with these tools alone,” he says. These problems require a new math. Take for example analyzing 1 TB of DNA per person with recomputation against multiple treatment plans and medications. It requires new conceptual tools. Herein lies the importance of Interpreta’s secret weapon, clinical mathematics. “You can’t compete against it effectively with more hardware,” says Dr. Ghouri. Interpreta uses proprietary knowledge representation (faster algorithms) that require 100 to 1000-fold fewer computing resources than competitors, yielding millisecond response times. The comprehensive cloud-based solution can integrate into legacy application workflows and other systems (HIE, EMR, CRM systems, and care management) through APIs and microservices. The single sign on portlets give healthcare providers an ability to process information without disrupting their workflow. As new data is created, clients can send them to Interpreta, and the cloud does all the heavy lifting and interpretation. Dr. Ghouri compares Interpreta’s work model to a combination of Microsoft Office and the cloud. “Office does not make movies,” he says. But it gets the core business needs accomplished for the overwhelming majority of users, including interoperability between applications. “You can copy and paste between Excel and PowerPoint, for example, without loss of meaning.” The same goes for clinical interpretation: There are quality protocols for doctors, hospitals, and insurers. Every stakeholder needs to be able to prioritize individuals for outreach and prevention and ensure that no patient with unaddressed abnormalities slips through the cracks. All treatment recommendations should combine macroscopic clinical data (like drug-drug interactions) alongside drug-genome efficacy and safety according to vetted standards like the FDA. The interpreter should run in real time within clinical workflow, because problems can’t be fixed after the fact. It has to run continuously, rather than episodically, as soon as new data arrives. Episodic interpretation is dangerous to the patient if you miss the event of even one single day. Running on the cloud, Interpreta performs all these tasks while taking away the requirements of local software and local knowledge base. This translates into a qualitative advantage in user experience and clinical reaction times up to 100-fold speed advantage, not just better benchmarks. To better understand Interpreta's unique approach, consider one of their priority-based modules, known as Continuous Member Prioritization, which re-computes information rendered from the analytics engine. With this, Interpreta performs precision match-making on a DNA-level to scrutinize every individual member and determine which patient is the most in need, the kind of care required, and the best available caregiver based on clinical acuity and severity. All of these actions are executed within a cloud-based calendar, which stores and calibrates data in the form of performable actions by automating closure of any outdated action items or tasks and upgrading itself with the influx of current data. Syndicated to a number of different touch points viz. doctors, care co-coordinators, case managers, and quality executives responsible for the relevant care, the calendar is like a comprehensive panoptical interpreter which creates personalized road maps in real time within a single framework. “Being a cloud-based API, it can directly communicate with any processor and integrate into a healthcare setting’s existing infrastructure to allow the generated data to befit any Electronic Medical Records (EMR), nursing apps or customer apps,” explains Dr. Ghouri. "Interpreta provides physicians, care managers, and payers with the patient-specific information needed for quality improvement, patient prioritization, population management, and precision medicine." 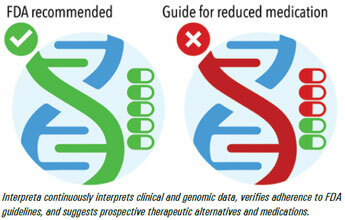 Daily re-computation and interpretation of a single patient’s clinical and genomic data delivers actionable insights for superior HEDIS (Healthcare Effectiveness Data and Information Set), P4P (Pay for Performance), and Risk Adjustment scores while greatly enhancing performance. To that end, Interpreta performs continuous genomic interpretations using actual DNA sequences, not simply reported biomarkers from third-party labs. 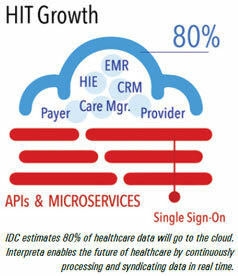 The healthcare sector is set to witness stellar analytical growth by 2025, as IDC estimates 80 percent of healthcare data will be moved to the cloud. The future of healthcare analytics will be personalized, supported by real-time processing that will eliminate heavy local IT support. Interpreta has already aligned itself with this trajectory. The platform has scalable computing power on demand for the hardest clinical queries, and elastic knowledge bases for interpretation. “This cannot be done locally at any reasonable cost, and migration to such an architecture is inevitable,” says Dr. Ghouri. Interpreta is creating the mathematical tools, data, and computational substrates for artificial intelligence in medicine, leading to outcomes that no one can fully predict yet. “It’s a GPS system that covers major highways and back-country roads at the same time. It’s a new worldview of patient care, but it is absolutely inevitable, and we plan to define it,” concludes Dr. Ghouri.